Cold Creek, the original Montgomery Estates neighborhood, is an upslope subdivision and as such, the mountain and lake views from many of the homes can be awesome. Some of the parcels back Forest Service land and the neighborhood provides easy access to miles and miles of outstanding view trails. Hikers enjoy hiking along the Cold Creek steam in early spring when the wild flowers are at their best. The High Meadows/Marshall Trail Montgomery Estates area is similar topography to the Cold Creek area with a little less climb and at the top of this subdivision you will find the popular trail head for Big Meadow and Star Lake. Meadow Lakes Estates, the Montgomery Estates neighborhood located just on the other side of Pioneer trail from the award winning Sierra House Elementary School is a level, easy access Montgomery Estates area. Meadow Lakes Estates also has nice wide streets, underground utilities and boarders meadows with Trout Creek and Cold Creek. 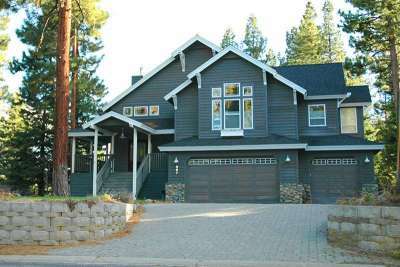 Kokanee Estates is an exclusive Montgomery Estates neighborhood with just eighteen homes. There is very little drive through traffic and a few of the homes have Trout Creek right in their back yard. The Golden Bear Trial Montgomery Estates area is the last Montgomery Estates neighborhood you encounter as you head west on Pioneer Trail toward Meyers. It has Conservancy owned unbuildable land on one side of the subdivision and U.S. Forest Service acreage on the other side. At the base of this subdivision you find the Lake Valley Firehouse with a popular sled riding hill behind it. You’ll also find the gorgeous Trout Creek meadow. There are tons of walking/running trails and dirt biking trails surrounding this area and as you discover the trails, you’ll find yourself taking in the views of the gorgeous Upper Truckee meadow with stunning Mount Tallac views. All five of the Montgomery Estates neighborhoods offer the best of Tahoe’s Natural environment combined with the convenience of being centrally located and just minutes to town. We have lived in Montgomery Estates for over 20 years and have really enjoyed it! Montgomery Estates is definitely worth your visit to see if it is a match for you!